The much-anticipated launch of the Xiaomi Redmi 5A in the Philippines was a resounding success. The so-called entry-level smartphone king sold out in less than an hour at Lazada. 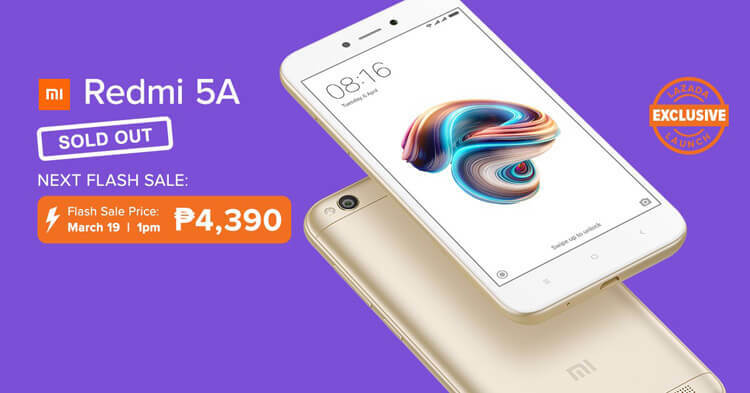 I belatedly checked the Lazada website at around 2PM yesterday and discovered to my dismay that the Redmi 5A has been sold out. But don’t worry, Lazada will hold another flash sale on Monday, March 19, 2018 at 1PM. You can buy the phone for only P4,390 or a discount of P200. The Redmi 5A is the “entry-level smartphone king” indeed. For less than P5,000, you can get a smartphone that rivals the more expensive models. The Redmi 5A sports a 5-inch fully-laminated HD display, a Snapdragon 425 64-bit quad-core processor, a powerful 3,000mAh battery, 2GB of RAM, and 16GB of internal memory. The phone is great for selfie lovers, too. With its 13MP main camera and 5MP front camera, you can take crystal-clear photos for posting on Facebook and Instagram. No need for an expensive DSLR camera when the Redmi 5A can take photos that are just as good! Definitely! The Redmi 5A is considered the best mobile phone in the sub-5,000 category. If you love taking plenty of photos and videos, the Redmi 5A satisfies your every need. Heavy mobile users will be happy to know that it has an eye protection mode that reduces blue light radiation and prevents visual fatigue, keeping your eyes safe and healthy. With the Adreno 308 GPU and Qualcomm Snapdragon 425 processor with 64-bit CPU, you can play the most modern mobile games with smooth and high-quality graphics. 2GB of RAM allows you to open several applications at once with minimal lag. The 3,000mAH embedded battery ensures long-lasting usage for many hours of fun and entertainment. That’s enough to watch videos for up to 23 hours and play games for 14 hours! That is why the Xiaomi Redmi 5A is so much in demand. You’ll get all these powerful features at an affordable price, rivaling phone models that are twice as pricey. Do check back on March 19 at 1PM for the next Lazada flash sale. I suggest that you put the Redmi 5A on your watchlist for faster checkout during the sale period.